Dermatosis (plural: Dermatoses) is a broad term that refers to any disease of the skin, especially one that is not accompanied by inflammation. Do not confuse this term with dermatitis, which is limited to inflammation of the skin. There are over two dozen specific types of reactive and inflammatory dermatoses; see this list at eMedicine.com for more information about specific types. Dermatosis can have many causes, including allergic reactions to common metals such as nickel (found in jewelry) or cobalt, fragrances, and topical antibiotics. Formaldehyde can also cause dermatitis/dermatosis, and it is a sensitizer as well, meaning that it can make your body or skin sensitive or allergic to substances that previously presented no problems. The mechanism by which a particular chemical causes dermatosis/dermatitis can vary. For example, some substances cause a "simple" allergic reaction, whereas prolonged exposure to hydrocarbon solvents can leach the natural oils from your skin and lead to irritation, dryness, cracking and/or redness. "Contact & Occupational Dermatology", Hardcover, 431 pages, 2002. Estimated price $121.44. Info and/or order . "Occupational Skin Disease", Hardcover, 792 pages, 1999. Estimated price $150.00. Info and/or order. "Pesticide Dermatoses", Hardcover, 416 pages, 2001. Estimated price $199.95. Info and/or order. "Prevention of Contact Dermatitis (Current Problems in Dermatology, Vol. 25)", Hardcover, 226 pages, 1996. Estimated price $240.00. Info and/or order. "Protective Gloves for Occupational Use, Second Edition (Dermatology: Clinical & Basic Science)", Hardcover, 368 pages, 1996. Estimated price $199.95. Info and/or order. Failure to use proper skin protection (gloves, aprons etc.) can result in irritation or even poisoning by absorption of the material through the skin. 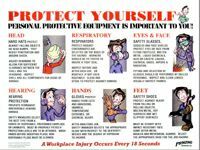 Always use properly selected gloves and appropriate protective clothing when working with hazardous materials. Preventing dermatitis at work - Advice for employers and employees at the U.K.'s HSE (1.4 Mb PDF download). Dermatitis, a multipage article at the Mayo Clinic. Counseling Patients About Common Skin Disorders: A Guide for the Community Pharmacist at Pharmacy Times. See also: dermal, dermal toxicity, dermatitis, erythema, urticaria.